There’s a lot that goes in to branding your business online, but it all comes down to one thing: creating a recognizable image in your customer’s mind. Branding is what helps a person remember you when it comes time to buy — and that’s why it’s really important. So we’re bringing branding down to basics. 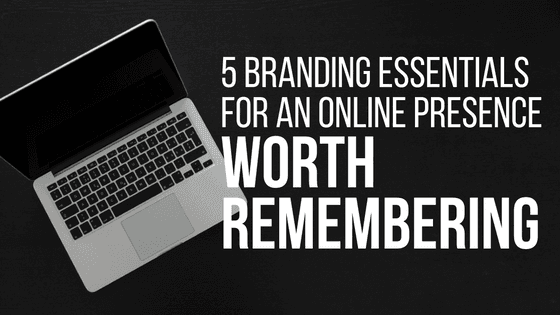 Here are the five most essential must-do’s for developing an online image worth people’s attention. 1. Decide what makes you different. There are tons of brands out there and if you want yours to make an impression, it has to be unique. That’s why the first step for creating a killer brand is to decide what makes you different. Maybe it’s the quality of your products, or maybe you can offer customers something none of your competitors can. Whatever your main selling points are, highlight them in your value props, slogan, and whenever/wherever you talk about what you do. It’s one of the most important decisions to make about your brand: how you want it to look. And your image doesn’t just mean your logo. The colors associated with your brand, your site’s design, the images used on your website, the content on your social media profiles — all of these play in to creating your overall look. So choose wisely and make sure every choice helps you look credible and unlike any other brand out there. A huge part of what makes your brand unique is its voice — i.e., what/who you sound like when you communicate. The personality of your brand should influence the voice you use every time you write. Why? Because a brand without a unique voice is boring and easy to forget. Whether it’s friendly, professional, funny, or something in-between, decide what voice you want your brand to have and stick to it. It’s the key ingredient for making your brand memorable: consistency. Your brand’s messaging, image, and voice should be consistent everywhere online. That way whether customers are checking out your site, social media, or ads, you’re easy for them to recognize. Bonus points for developing a style guide with instructions for applying your branding so everyone stays on the same page. Once you nail down the details of your branding, the next step is to get it in front of people. Start with a solid foundation by having a site that covers all the bases. Expand your social media presence by sharing valuable information and building relationships. And make sure you’re listed in online directories and review sites. Do those things and watch your branding make a big impression on more people. We’re experts at helping businesses build their brands online, and we want to help yours look its best. Call 844-207-9038 or email hello@mopro.com to learn more about how we can make you look awesome online.